A couple of weeks ago Trump accused President Obama of wiretapping Trump Tower before and during the presidential campaign. As usual with any and all of Trump's accusations there is no proof offered regarding his allegations. The Justice Department and our intelligence agencies quickly denied that this every happened or could have happened. But that didn't stop the Conspirator-in Chief. He reiterated his baseless accusations and demanded Congress investigate. Surprise! They are doing just that Donald! Today in a public hearing before Congress, FBI Director James Comey and NSA Director Michael Rogers vehemently denied Trump's accusations that he or Trump Tower was wiretapped by anyone. They also reiterated that no President could do this! Comey also disputed Trump's accusation that British Intelligence agencies were involved in Trump's paranoid accusations. There is absolutely no evidence whatsoever to substantiate these wild , maniacal, paranoid tweets of Donal Trump, yet The White House says the President stands by his claims! What must his staff be thinking? This man is seriously mentally ill. If he were just an ordinary private citizen this wouldn't be so serious, but it would raise questions about his ability to be a part of normal society. But Good God, he is the President of the United States! He has the ability to nuke the entire world! 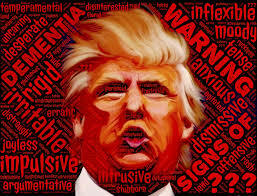 He does not have the mental competence to carry out the duties of his office, yet the Republican Congress is willing to give him a clean bill of mental health, just so they can stay in power! If they don't do something about his man our country will soon be in grave danger! The Biggest Coverup in American History. Did Trump Release His Own Tax Returns? Trumpcare Findings Announced by the CBO! A Justice Department Without Lawyers? What A Mess We Are In!